Finance – Canadian Finance – Canadian Financial – Canadian Financial Services – MONEY Services – Customer Service is important to investors. Finance Canada – Canadian-Finance.com Canadian Financial Bloggers. Investment and Finance. Financier – Finance Definitions. High Finance – Lending – Financing – Borrowing – Public Financing. social finance and the social media. Not exactly what you had in mind when you think elephants but this analogy turned idiom is a great way to describe and explain the complexities of personal finance in an easy and manageable way. 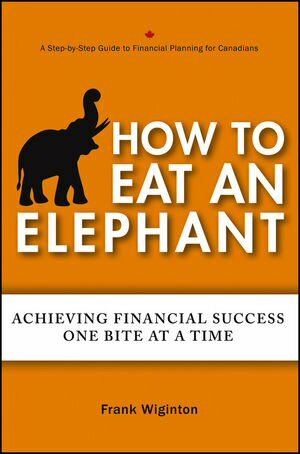 Frank Wiginton has developed a reputation as an easy-to-understand financial educator and has written an interesting book entitled “HOW TO EAT AN ELEPHANT – ACHIEVING FINANCIAL SUCCESS ONE BITE AT A TIME” that includes access to a self-help website (http://www.howtoeatanelephant.ca) that takes people through his entire process. His chosen title is very appropriate as developing a sound financial plan is perceived as a daunting exercise for most people. Frank uses a variety of stories and scenarios to share his thoughts and perspectives on each part of your plan. Frank takes people through a logical process beginning with setting goals followed by that most feared word – budget! To his credit, his process helps relieve people of the much of the stress that often accompanies this challenging exercise. Frank takes his readers on a journey through all of the important parts of a sound plan including debt and cash-flow management, life and disability insurance along with critical illness and long term care needs. He discusses pensions and other retirement resources including OAS and CPP/QPP, your RRSPs and TFSAs. He provides sound guidance on savings for education requirements and the legal niceties required to ensure our wishes are carried out in the event we are unable to act for ourselves and after we pass away. f) you need to monitor your progress regularly against your goals and make needed adjustments as soon as the need becomes apparent. Like every effective author, Frank has strong personal beliefs and has done a very good job at sharing them with his readers. Even if you choose not to agree with his perspective or views, the process he uses to explain each part of the plan ensures that you go through a logical evaluation of the various options before making a decision rather than shooting from the hip. Throughout the book, there are “One Frank Thought” boxes in which his personality shines through while sharing some unique perspectives on the topic in question – they add greatly to both the material and the concepts he presents. A very worthwhile investment of $21.95 plus taxes is available at fine retail establishments including Chapters and Indigo through Wiley and Sons Limited http://ca.wiley.com/WileyCDA/ the publisher or www.howtoeatanelephant.ca. Sun Media Corporation announced Tuesday a restructuring initiative expected to result in over $45 million in annual savings. The moves, which include the closure of production facilities in Ottawa and Kingston, include the elimination of nearly 500 positions across the organization. “This restructuring is regrettable but warranted by changes in our industry which force us to align our cost structure with the new reality,” said Pierre Karl Peladeau, president and CEO of Sun Media. Peladeau said the initiative doesn’t diminish his company’s commitment to its publications, readers, advertisers or employees.